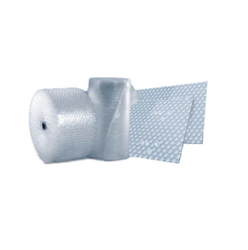 We are providing a remarkable and noteworthy range of Bubble Wrap. All our products are designed and crafted using optimum quality low density plastic granules as per industry set norms and standards. We offer bubble wraps which are used to protect and store items at the time of shipping.These bubble wraps contain numerous small air pockets to provide protection to the cushioned item. This range is available in the standard size of 6.0 to 25.4 mm diameter and 4 mm height. We are a most trusted name among the topmost companies in this business, involved in offeringAir Bubble Cover. - Cohesive foam only sticks to itself, not to your product. - Set product on foam then fold and press sides for a custom fit. - Will not leave a residue. - Cross-perforated every 6 inch for easy tear off. Since the inception of our organization, we are highly involved in offering an extensive collection of Packaging Air Bubble Film within the specified time frame.